So on Day 8 I decided to see Mt Fuji again. This time I was going to get there by the local trains as opposed to taking the bullet train. Only did this because I wanted a challenge. I can't really tell you the directions since I don't even know myself! So here's what happened. 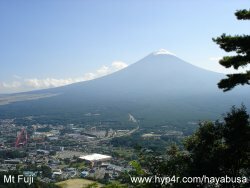 Firstly Mt Fuji is easy to get to if you take the bullet train or simply ask the hotel concierge. However I wasn't going to do that because I wanted a adventure. I wanted to look around the 5 lakes district just as if I was on the 'Amazing Race' TV show or maybe at a stretch a game avatar in World Of Warcraft. I guess I wanted to feel young again. Instead of going to central I took off from Ikebukuro and 'guessed' which line to take to the Japanese map I had. It was Ok until I reached Yokohama again and realized it was a mistake. I then head back to central and once again attempted to ask for directions. I found what I though was the line and 'god only knows which one it was' and I headed off. I turned on the GPS just to be on the safe side. I then reached a local station after and other couple stations seemingly off the beaten track. What can I say - outside the major centers English language signs are literally impossible to find. What I gathered from the locals was that I was at the right station but I needed to change platforms. It was not encouraging to see the low numbers of Mt Fuji brochures. The domestic travel industry is quite large from my reckoning. There are plenty of brochures for holiday destinations around Japan and less for overseas destinations probably because no other country speaks Japanese. It is safe to assume that the majority of Japanese do not take overseas holidays? The reasons are mixed of course - and my story here isn't about this so of thing. It was about 30 minute wait until the next train arrived and I was encouraged by the type train that stopped. It was the Mt Fuji express so to speak. Yes it was an air-conditioned special train that was painted in Fuji colors. So about another 40 minutes later I had arrived at one of the Fuji stations that had the best views. What it was called I have no idea. The station had a Thomas the Tank engine promo banner - which was ironic because the there aren't any steam engines actually working - only as museum pieces at the station! It was after 12 and I had taken over 5 hours to get here! I had fun - very tiring but a great day. The walk to the Mt Fuji look out was a couple km's down a hill then take a cable car to the look out. The walk there was great but the walk back was going to be torture. It was a lovely albeit slightly humid day but I loved walking through the winding streets and to the lake side hotel area. I got to see lots of interesting cars most of them quite old at least 6 years! Eg. prior generation Honda Civic. The look out was not busy so we basically had the look out to our selves. The views of the lakes and the surrounds was lovely - worth the trip every time. It's not always possible to see the famous mountain due to atmospheric conditions and you can of course do other things Eg. choose to climb it and do other activities, but you should always take the chance to see the silhouette as it overlooks the land around it. The trip back was less eventful and since it was peak hour - when the kids finished school we didn't get the 'good' train. The regular commuter train was not as well appointed as the Fuji Train and when full of people it is rather hot. Besides that I simply sat on the train it got to the point where we got on earlier then changed tracks! I honestly thought it was a fun day! Tomorrow was a full on shopping day for me. As you can tell I've been busy exploring Japan and that's what you should be doing too! So if you've waiting for the price commentary that's probably next weeks article.